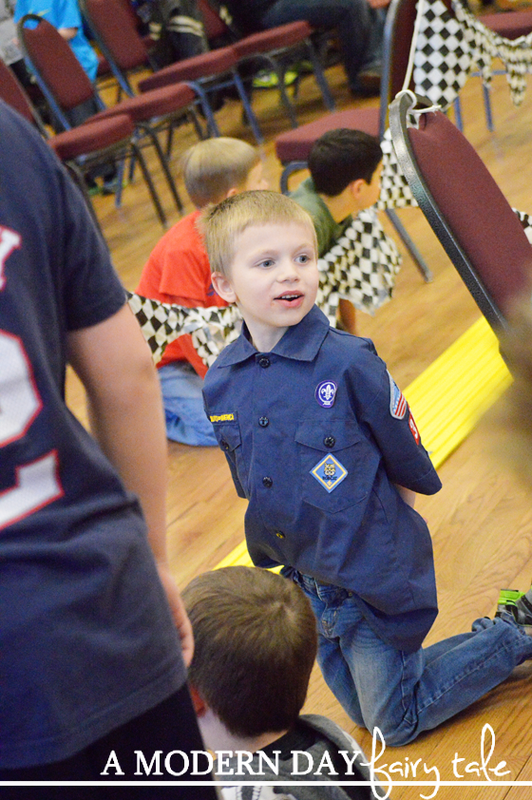 A few weeks ago, Shaun's Cub Scouts Pack held their annual Pinewood Derby! 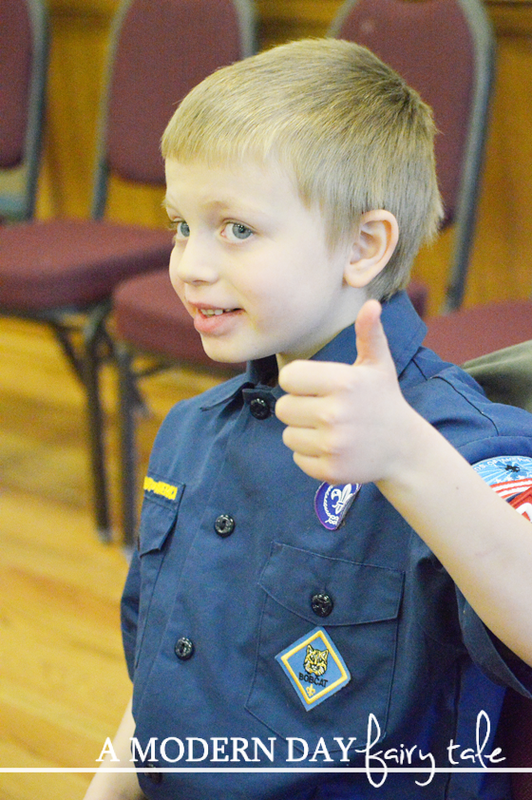 It was his first time participating and the excitement was high in our household! 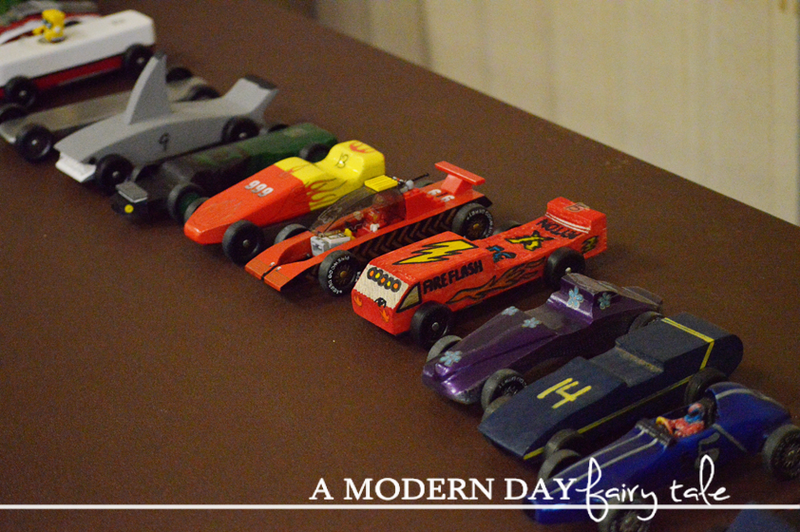 Right away, Shaun and Daddy set out to figure out how to make the absolute best derby car they could. 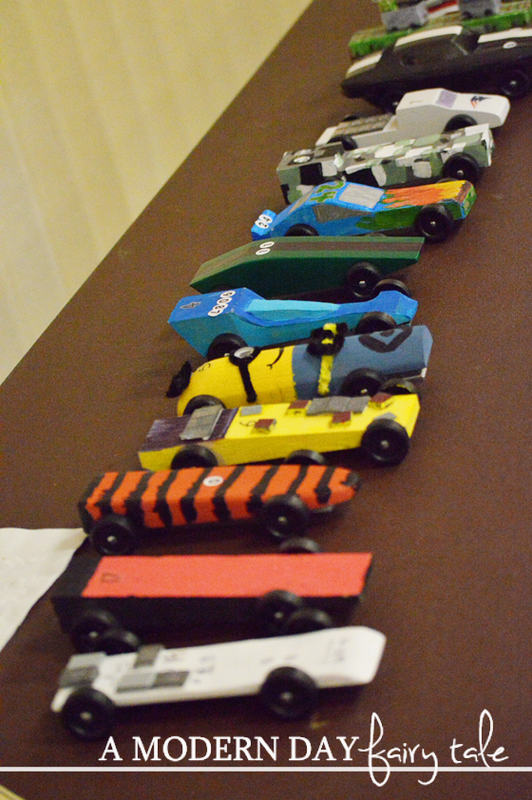 They searched Google, studies YouTube and came up with the perfect car design to get the most speed. Shaun then came up with his own idea of how he wanted it to look- a Wii Remote with 'Wii-n' in place of Wii! Clever, right? Next came the actually building! They bought their tools and went right to work! Shaun even used the handsaw to help with the sawing (you can imagine this mama's fear!). They sawed, they sanded, they painted...and at the end they added the weights to give it the most speed. Shaun was ready to race! Now, to be honest, we really didn't expect to win much of anything this year. 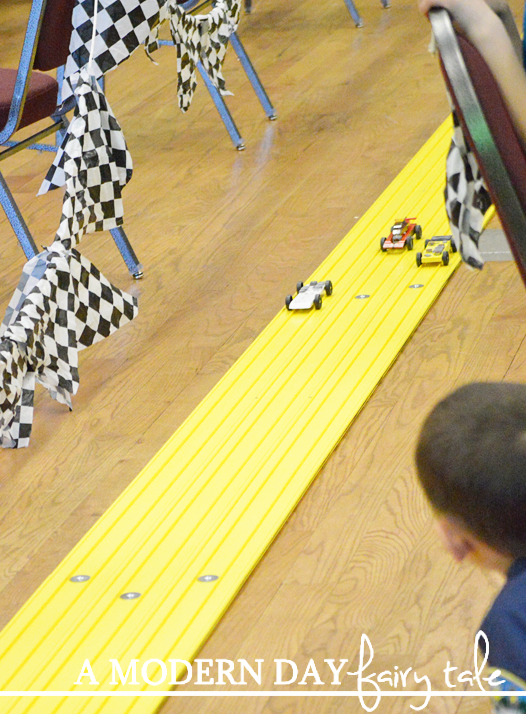 We'd switched packs in the middle of race preparations, leaving us behind anyway, and honestly none of us had any experience with the Pinewood Derby at all! So, we prepared Shaun for the chance that he might not win and that this would be okay. You can imagine our excitement when he won his very first race! And then again when he won the second...and the third! He raced for a total of 5-6 heats and won EVERY SINGLE RACE! He was beyond ecstatic. He'd seen the trophies up front and just knew that having won each race, he MUST be getting one of them. He could not wait. And then the results came in and Shaun discovered he had placed third...just .002 seconds behind second! Amazing! He was thrilled! He'd done it, he'd placed...his very first time! It should have been a fantastic moment, and it was...up until the second the third place ribbon was placed in his hand. Only first and second received trophies. Just like that his hopes were shattered and he broke into full on 'bang-your-head-into-the-wall' meltdown mode. It was awful. You see, in many ways people with autism are really just like everyone else but more extreme. Where we have interests, in autism they become obsessions. Those little stims that we all have (biting your nails, clicking your pen, tapping your fingers) became bigger and more frequent. When they are excited, they are through the roof. When they're upset, they are devastated. The highs are high and the lows are low. And going from the highest of highs to a low? The plummet is overwhelming. And that's just what happened on this day. With each race and each win, Shaun excitement grew and grew. Add in a hectic social situation with loads of noise and excitement, and it was no surprise that he was in overdrive. And when the mood is good, that's not a bad thing. The problem with autism is, it doesn't always take much in those heightened states to bring it all down. The moment something happens that is unexpected or out of the norm it can quickly come crashing down. So, on this day when Shaun realized he was not getting the trophy he was so sure he'd receive, he lost it. We've all been there right? When we're so close to something and watch it slip by...oh the disappointment we feel. Again, with autism, those feelings are amplified. So, why am I sharing this story? To show that you never know what is truly going on in someone's life. Honestly, how many of us have seen a child misbehaving and thought negatively of them or their parents? Sure, sometimes kids truly are being rotten or throwing a fit because they didn't get their way...but we cannot know that simply by the little bit we are allowed to see. So, next time you see a child crying and screaming when out and about, stop and think for a moment before you judge. Instead of automatically assuming that this child must be giving his mother a hard time, consider instead that he may be having a hard time himself. I love how you used your personal experience to emphasize the need for empathy. It reminds me of that quote - “Be kind, for everyone you meet is fighting a hard battle". Thank you for sharing! Very spiffy cars! I understand about the judgement thing...and if I let myself react to other people's judgement I'm almost always going to do the wrong thing, not the right thing. But it's so hard sometimes. Thank you for sharing--children, no matter what they have or don't have, are a blessing!